I might have thought "Atlantic City" was more of a fantasy had I not lived for several weeks circa 1970 in a hotel near Sunset Strip named the Sunset Marquis. It is now a luxury hotel of the same name, but at that time a room was $19 a night, and the residents included Tiny Tim, Van Heflin and Elaine May. You dialed room service, you got Greenblatt's Deli. A scrap-iron dealer named Jack Sachs presided as the "mayor" from his poolside efficiency. He ran the cocktail hour as his personal salon, supplying whiskey to the circulating population of show-biz folks -- Jackie Gayle, Roy Scheider, Harold Ramis -- on their way up, down or sideways. A similar establishment provides the location for Louis Malle's "Atlantic City" (1980), which takes place in an apartment house near the Boardwalk. It's slated for demolition, and all around are vacant lots filled with rubble and the sky-cranes of new construction. Every exterior shot seems to have a background of debris being shoved out of upper windows, or bulldozers clearing vacant lots. In this doomed building live three people: An oyster-bar waitress named Sally (Susan Sarandon), an aging numbers runner named Lou (Burt Lancaster) and a widow named Grace (Kate Reid), who came to the city 40 years ago for a Betty Grable look-alike contest and depends on Lou to run her errands, some of a sexual nature. She lives in an apartment so filled with photographs, stuffed animals, feather boas, geegaws, silk festoons and glitz that you might think it is a fantasy, but not me, because I saw Tiny Tim's apartment one morning when the maid left the door standing open. Lou claims to have been big-time in Vegas in the old days, "a cellmate of Bugsy Siegel," no less. Now he walks a daily route through Atlantic City's urban decay, taking 25-cent bets on the numbers. It's implied that a stipend from Grace keeps him afloat. At night he stands behind the blinds of his darkened apartment and watches as Sally engages in an after-work ritual. She cuts fresh lemons and caresses her skin to take away the shellfish smell. Later, after they know each other, Lou confesses that he used to watch her. She says she knew there was somebody, but didn't know who. "What did you see when you looked at me?" she asks. He describes her ritual in great detail, and when the camera cuts back to her, she has opened her blouse, as if his words were stage directions. Into this closed world come two loose cannons, Dave and Chrissie. Dave was once married to Sally, then ran away with Chrissie, Sally's younger sister. They're a better match, equally spaced out; Sally on the other hand wants to succeed. "Teach me stuff," she asks Lou at one point. She's taking lessons in blackjack from a casino boss (Michel Piccoli). Dave has stolen some drugs in Philadelphia, wants to sell them in Atlantic City, and has a contact named Alfie (Al Waxman) who runs a permanent poker game in a hotel room. Gangsters from Philadelphia inevitably come looking for their drugs and for Dave, who becomes dead. Chrissie becomes the confidant of Grace, Lou inherits the drugs and makes the deals, and then he buys himself a new white suit and sets himself up as a knight in shining armor to protect Sally from the guys who killed her ex-husband. There is nothing particularly new in this screenplay, written by the playwright John Guare, and assembled from drugs, colorful characters, a decaying city, memories of the past. 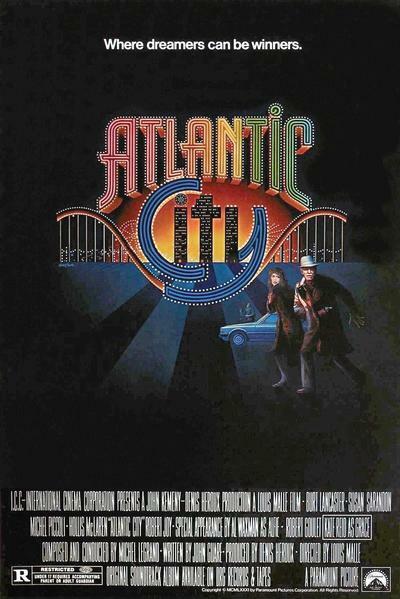 What makes "Atlantic City" sweet -- and that's the word for it -- is the gentleness with which Lou handles his last chance at amounting to something, and the wisdom with which Sally handles Lou. Lou wants to take the drug money as a gift from the gods and recreate his glory days. The question is, were there really glory days? A gangster as important as Lou claims to have been should be, by now, either rich or dead. Lou is not a letch. He has dignity, the same kind of instinctive aristocratic self-regard that made Lancaster's performance in Visconti's "The Leopard" (1963) so authentic. When you embody dignity, you don't need to play it. There is a moment in the hotel room with the poker players when he casually uses the side of his arm to brush away someone who invades his space. And a moment when he says quietly to another man, "Don't touch the suit." That he can seriously see himself as the lover of the much younger Sally is more plausible when he uses the word "protector." When he actually does protect her, his dreams seem within reach. The giveaway is that he's so elated when he defends her from an attack by two hoods. A real gangster, a real buddy of Bugsy's, a real former hit-man, would not be as excited as a kid. Yet Lou's childlike delight at his own startling behavior is part of the man he really is: Like the narrator of Scorsese's "GoodFellas," he admires and envies gangsters and likes to be a big shot. Louis Malle (1932-1995) was a French New Wave pioneer who alternated between documentaries and fiction, between France and America. His first feature, "Elevator to the Gallows" (1958), grew directly from the 1950s Frenchnoirperiod that gave us Jacques Becker, Jean-Pierre Melville and the late flowering of the actor Jean Gabin. Their French noirs were more elegies than adventures, more concerned with failure than triumph, less interested in action than the close observation of the daily behavior of their heroes. The best scene in Becker's "Touchez Pas au Grisbi" shows Gabin preparing a late-night dinner of pate for the old pal he has loyally supported through one fiasco after another. After dinner, he gives him a toothbrush and pajamas. For Lancaster's character, the association with Grace begins with the fact that she needs Lou to survive. To conceal her desperation, she insults and criticizes him like a diva, and he sees right through her. Grace the aging beauty (and perhaps retired whore) finds a natural rapport with Chrissie the hippie, who believes in reincarnation and foot reflexology. They're far apart in age, style and beliefs, but they both construct fantasies to wall off the grim reality surrounding them. As for Lou and Sally, there is something tender and subtle going on. Neither was born yesterday. Both have dreams. Both have lived with disappointment. Even though they could be lovers, they have no future together, and maybe no future separately. They don't need to say this to each other. When he helps her, it is because she needs help, and equally because he needs to help. His payoff is not living happily ever after, but in having an eyewitness who knows that at least once during his descent into obscurity he stepped up to the plate and acted as he thinks a man should act -- a man like the men he admires, who may have been criminals but were powerful and respected. The movie does not deny reality; it ends with what must happen, in the way it must happen, given what has gone before. Ten years after his death, Louis Malle is the subject of a tribute at Facets Cinematheque in Chicago. The nearly complete retrospective includes films ("Au Revoir les Enfants," "Lacombe, Lucien," "Murmur of the Heart," "Damage") that are as good or better than "Atlantic City," but which are surprisingly not in print on video. The British critic Philip French, who knew Malle since his first film, thinks "Atlantic City" is the best of his American projects, although I would choose "My Dinner with Andre" (1981), and Stanley Kauffmann thinks "Vanya on 42nd Street" (1994), Malle's last film, is the only successful film of a Chekhov play. When I told a French film official last autumn that I had just seen and admired "Elevator to the Gallows," I received not a smile but a scornful "pffft!" Perhaps Malle alienated his countrymen by moving to America, by marrying Candice Bergen, by taking on so many American stories ("Pretty Baby," "Alamo Bay"). Malle did not follow his New Wave origins into ideological extremities, like Godard, but like his German contemporary Fassbinder frankly desired large audiences. What's interesting, even with a seemingly commercial project like "Atlantic City," is how resolutely he stayed with the human dimension of his story and let the drug plot supply an almost casual background. Here is a movie where reincarnation is treated at least as seriously as cocaine, and the white suit even more so. "My Dinner With Andre" is also in the Great Movies series, and Ebert reviews many other Malle films, including "Elevator to the Gallows." There are also 1972 and 1976 interviews with Malle.